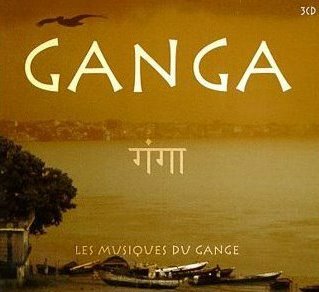 Ganga: Les Musiques du Gange is a three-disc set of whimsical worldbeats, featuring the talent and beauty of the Music and Dance Academy of India. More appropriately, this album is a perfect reflection of the spiritual instrumentals found in music of this part of the world. ~ MacKenzie Wilson, All Music Guide. This amazing compilation represents a series of significant "roots recordings" of Indian popular music, including chants (mantras), instrumental music and impressive natural soundscapes. Most of the music was collected impromptu along the margins of the Great Mother Ganga: the Ganges River, the most sacred river in India (captured all the way from the spring [in the Himalayas] to the mouth of the Ganges river).